Now the weather is warmer chocolate has a tendency to melt in the fingers, but Hotel Chocolat have released a selection of new chocolates to chill. 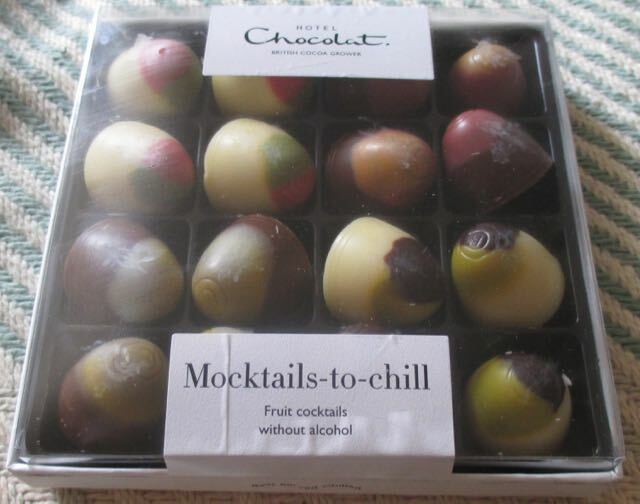 Amongst them are these very seasonal Mocktails-To-Chill, like cocktails but without the alcohol. 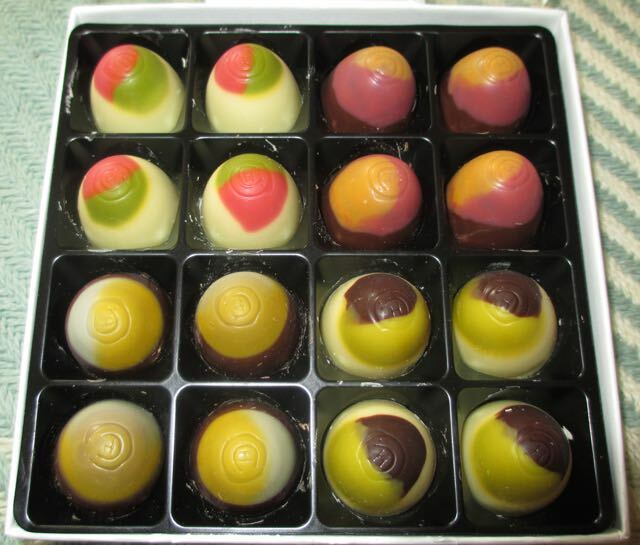 There are four varieties in the box, and they all look so pretty and colourful, once the lid is off. Make sure you have given them 30 minutes fridge time before tucking in. This had a soft strawberry taste, and was encased in white chocolate. There was that hint of slight bitterness confirming the “wild” flavour. It was an easy to eat variety, and as strawberries are the official fruit of summer, very seasonal too. This chocolate has a milk chocolate shell, and is filled with a remarkably fruity soft centre. The peach is strong and fresh, and works well with the chocolate. There is a lovely delicate aftertaste of tea which just finishes the chocolate nicely. I think of all the chocolates this one sounded the most interesting, or perhaps that is just me finding the word cinnamon and getting excited it contained my favourite spice. The shell is milk chocolate and the filling has a smooth pineapple taste, it is mild and slightly spicy, the nutmeg and cinnamon giving the flavour a lovely warming edge. It had a good tropical feel. In a white chocolate shell, the filling of this pretty much blasts summer at you. The lime cream inside is mixed with the most wonderful flavour of garden mint, and the zingy taste just ends up being so very fresh. My favourite was the Peached Ice Tea, I just loved how it could combine a strong fruit taste with a delicate base. Which one is you favourite? If you want to find out, the lovely folks at Hotel Chocolat are also offering a box of these to one Foodstuff Finds reader. Simply enter the Rafflecopter giveaway and you may have the chance to try these Mocktails-To-Chill for yourself. Wish I hadn't read this tonight- now have mega chocolate cravings. Boo!